Our chapter was well represented at the Region VII Chapters Regional Conference this July. The conference was held in New Orleans, and twelve members of our Chapter were in attendance. Activities included a technical seminar, a welcome party at Pat O’Bryan’s on Bourbon Street, committee workshops, and of course, lengthy business meetings. Most of us found a way to enjoy some time in the French Quarter during breaks. The Awards Luncheon was very rewarding for the East Tennessee Chapter. 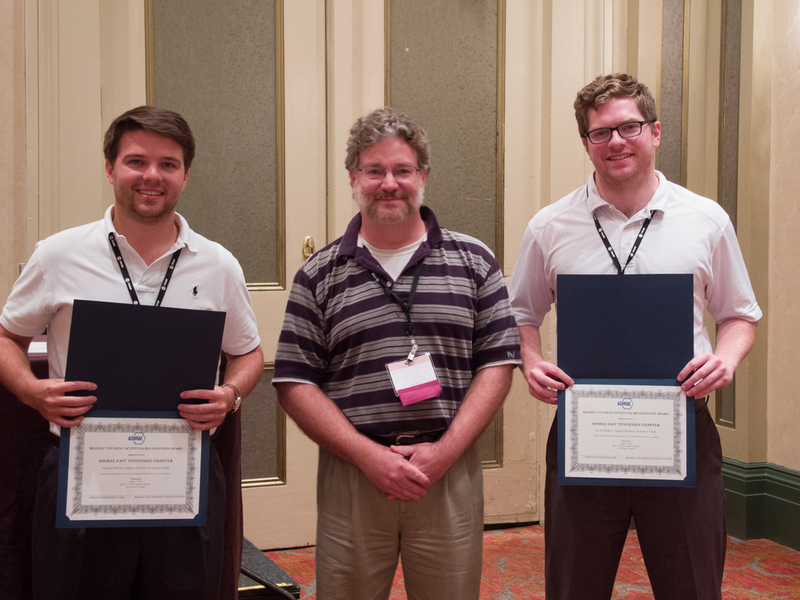 Scott Hacker and Andrew Bosse received a first place award for student activities, as did Wayne Doane for research promotion. Wayne also received a Full Circle Chevron for research, and an Endowment Chevron for research. Nancy McBee received a first place award for increasing on-line transactions, and a second place award for membership promotion. Tom Werkema received a first place technology award for his highly energy-efficient home. Finally, 2012/2013 President Bill Jacoby received the Presidential Award of Excellence for our Chapter, with "Special Citation" and the "Star" Award. Our chapter finished second in the Region, just a few points behind the West Virginia Chapter. Although Bill was not present, it was special to see Bill's father, George Jacoby accept awards for Bill. New Orleans was a great time for all, and we look forward to another great CRC in Memphis next summer!